The sustainable and dominant growth in Indian market for more than three decades gladdened Yamaha to launch bikes that perfectly suits Indian roads and needs. Yamaha Saluto is one of such much awaited launch that is designed with modern technology that gives an amazing mileage of 78 Kmpl. With the weight of 112 Kg Saluto gives best of the class mileage compared to other models in this segment in the market. Less weight with amazing pick up and style makes handling very easier which gives you comfort and luxury while driving in urban condition. Yamaha Saluto has 125cc capacity single cylinder engine based on Blue core technology with wonderful style. With four stroke engine with air cooling, Saluto produces a maximum horse power of 8.3 PS at 7000 rpm along with maximum torque of 10.1 Nm that gives startling pickup. Yamaha Saluto is provided with telescopic fork in front and swingarm suspension in rear end to give you smooth ride in rough Indian road conditions also. Saluto from Yamaha has 7.6 Liter fuel tank and uses carburetor for fuel supply. With minimum ground clearance of 180mm makes ease foot reach with ground and 1,265 mm wheel base give colossal grip with road.Yamaha Saluto uses Capacitor Discharge Ignition (CDI) system to ignite the fuel. Yamaha Saluto also rolls into road with tubeless tires along with eco zone speedometer. 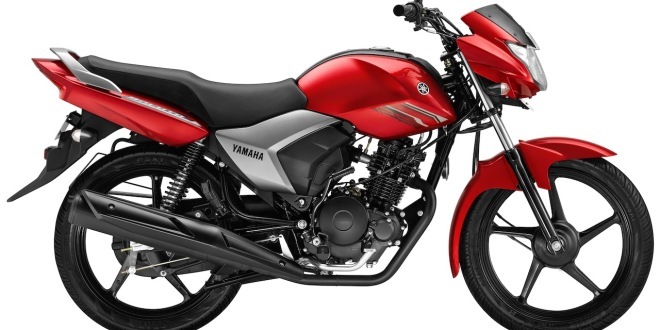 This four speed Yamaha Saluto comes in two colors namely Red and black priced at INR 52,000 (Ex-showroom, Delhi).